On my second read through of the TrendsWatch 2015 report I was surprised to find that it brought up more questions than it answered. Perhaps that’s what they were going for – facilitating conversations surrounding these trends, and not so much answering the questions that might arise. Maybe they were trying to give us a framework for assessing how we are influenced by, and interacting with, these trends. As a side note for those of you museums up for re-accreditation, I think it also reads a little like a checklist that AAM will expect to see you addressing in some way. That said, I really want to focus in on a few key questions that came up for me while reading, and ask you the same things. Take a few minutes to reflect on them and let me know what you came up with! I’ll assume you’ve all gotten that head start I gave you, and read through the report already, but if you haven’t, it’s available from the Center for the Future of Museum’s website if you’d like to pause here. A few housekeeping things before we get into it – my goal here is to make the info in the report relatable to those of you who don’t work in a museum, or even the arts. So, just because this report is from the AAM, don’t count it out! Also, I’d like to keep these posts fairly short since the report cited the statistic that the optimal blog length is just 1600 words (a 7 minute read) from FastCompany. In the interest of holding your attention I’m going to break up the report by each chapter and tackle them as a series. You know I love a blog series. That means I’ll go over Open Data here, then Ethical Everything, Personalization, Rising Tide, Wearable Tech, and finally Slow Culture. Now- on to the report! The first proper section of the report (after the intro, and the how to use this report stuff) talks about open data, open source technology, APIs, and the like. I have to admit, I hadn’t spent a ton of time trying to learn or understand this topic before reading the report, but it was enthralling, and even a little frustrating at times, to dig deeper into what open really means, and how it applies to non-profits, arts organizations, small businesses and marketing for any of these. The first thing I want to point out in this section are the fascinating ways open data is already being used for some really diverse goals. The report cites a project by the New York State Civic Engagement Table and the Denver Regional Equity Atlas which are pretty fantastic, but I also think projects like these by Sha Hwang (whom you might remember from my NAMPC blog) and this one from the New York Public Library are also amazing ways to use open data to create useful (and really beautiful) tools for the public to use and interact with. 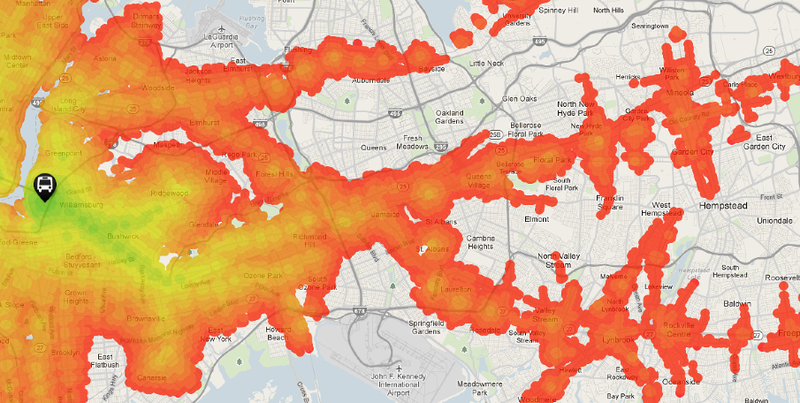 Transit map by Sha Hwang for Trulia using city transit data and commute time data. Many barriers stand in the way of converting data to knowledge, the foremost being compatibility. Interoperability is chimerical if data sets aren’t configured to talk to each other. To this end Code for America is promulgating recommended formats to make data easier to access and use. The link above takes you to Code for America’s description of their current data formatting categories. Currently there are standards for referral services, park and nature trails, food inspectors, and housing data. The idea is that if local governments begin to format their data in the same way, then different departments, and even other local agencies, businesses and citizens will have an easier time finding what they need. So – brainstorm time: what pieces of your business data can you start converting now, so that you too can start contributing, and benefiting from, this streamlined system? See, I told you there’d be some reflection questions. In the “What This Means for Society” part of this section, I just have “HOW?” written all over the margins. How does open government data facilitate transparency? How did the National Day of Civic Hacking improve communities? How are companies building business around public data? Even after reading the links in the report, it’s a little murky, but my biggest takeaway was from Beth Noveck’s TED talk, namely: “open” is really about being collaborative. Opening data, whether we’re talking about public data like the census, or organizational data like the makeup of your workforce, is useful, but it’s more powerful once you let others collaborate with you to make something new. A great example of this is Joseph Gordon Levitt’s hitREcord project. The site allows individual makers – artists, musicians, designers, writers, etc. – to upload their creation and give it over to whoever want to re-mix, re-use or layer on top of it. They make collections at the end of the year, and the end results have been really stunning – I highly recommend checking it out. 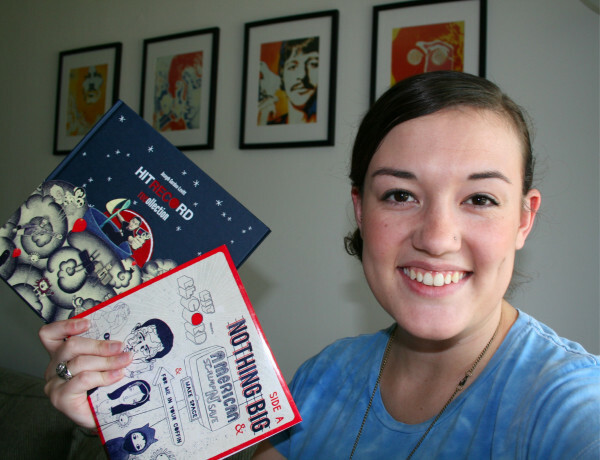 Me with my very first hitREcord compilation in 2011. Later in this section, the report discusses what museums can do to apply the open philosophy to their own data – which made me wonder – what constitutes data? For museums, maybe we mean data about what’s in their collection, but for a small business could data about your store locations, or data about how frequently you roll out new products, be useful to the public? What other kinds of data might be used to collaborate with local organizations, non-profits, other businesses or local government agencies? It made me wonder if facts and figures might just be the beginning. What about images, corporate branding pieces like logos and typefaces (which the report mentions), and other things we wouldn’t normally deem “data”? How can you make those things available for public consumption and re-purposing, and what are the risks/benefits of doing so? The other side of the same coin would be – What kind of data would you like to have? The report lists city demographics, use of public and private transportation services, and school performance as some data that may already be open and available to you through your local government, but they also make note that when you open up your own data you might be surprised at how the public uses it – to help YOU. When [you] put [your] data out there to play with, [you] may learn a tremendous amount about what people value about [your] work, and how people want to work with [you]. I replaced the museum specific language with you for impact, but you get the picture. You might get a whole new set of data to learn from once you see what people do with the info you give them. Opening your business up to this kind of collaboration is an opportunity to really learn something about your audience, and then promote your own goals, with theirs in mind. Again, you’re creating opportunities for people to engage with you, while also learning how you can make their experience with your business better and more than a purchase. In the end, we could all use more collaboration. True collaboration, where we work together to create something new, is a great way to advance your marketing goals while also learning a little bit about what your customer needs and wants from you. Collaboration, aka the open economy, is the doorway that can lead us to a new way of doing business – one that’s not just buying and selling, but creating an supporting communities. We’re already seeing this work in spaces like etsy, so it’s high time we apply it to other businesses. Check back soon for a discussion of the next section – Ethical Everything – an idea that has an undeniable marketing advantage.